I should be binding a book or stitching on my scroll right now, or at least laying down in the dark with an ice pack on my face since I woke up with a vicious headache and a sinus infection. But I’m doing better, about to wash out my head pipes with a neti pot, the coffee is hot, and I’m missing blogging. It’s been 20 days since I wrote the last coffee pot post. I like my new visual journal project, although I have to play catch-up now and then, and will continue it. I’ve been concentrating on my book projects when possible, and my last class is tomorrow night. I will finally have that BA in Studio Art that I’ve pursued off and on since 1984! I put one piece in the senior show: this tapestry. I’m pretty sure that I am the last student to graduate that did most of her studio work in the long-defunct fibers concentration. The Washington D.C. trip was great but I’ll have to blog it later, along with a big post on the work I’m doing for this ceramics class. Speaking of which, I really need to get to work on finishing up some books for this class, so I’m checking out for today, other than the visual journal later. 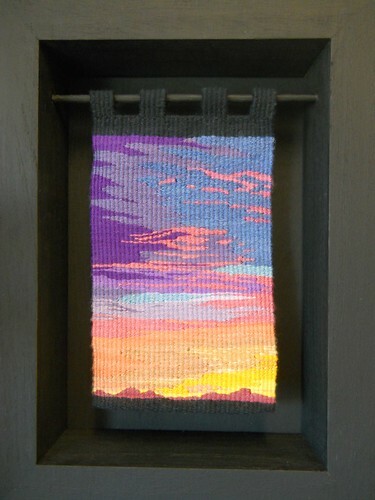 Beautiful tapestry! I like the way your have it displayed, too.